Search engine optimization (SEO) is an important part of lead generation because it makes your site more visible to potential leads. Without good SEO, you risk never being found. However, just optimizing your website for search will not guarantee you a page one listing on a search engine. If only life were that easy! Remember that your competition is also vying for this position, and chances are they also know about SEO. Search engines factor in multiple criteria to return websites that they feel are the most useful to their users. There are three major search engines to consider: Google, Bing, and Yahoo!. Although Google clearly has the lion’s share of search usage — 66.7 percent according to comScore — you do want to keep the other search engines in mind too. People have their favorites, and you certainly don’t want to alienate those using Bing or Yahoo!. For the most part, many of the techniques you apply to being optimized for Google apply to the other search engines as well, but there are a few things to keep in mind about each. Google is the search giant. With 66.7 percent of search traffic, it’s safe to say that Google is the one you should be optimizing for. And Google is very tough to optimize for because all your competitors also know that Google is the 900-pound gorilla and are also vying for prominent listings on Google’s search results. Google uses a top-secret and complex formula to determine what your website is and where it should rank, and this formula (or algorithm) changes constantly. You need to be up on the trends for how each algorithm change can affect your optimization. Google also has a variety of tools to help you further optimize and analyze your site including Google Insights, Google Trends, Google Zeitgeist, and Google AdWords. In addition to web search, Google has image search, news search, shopping, maps, news, videos, blogs, discussions, and more so users can customize and filter their search results. 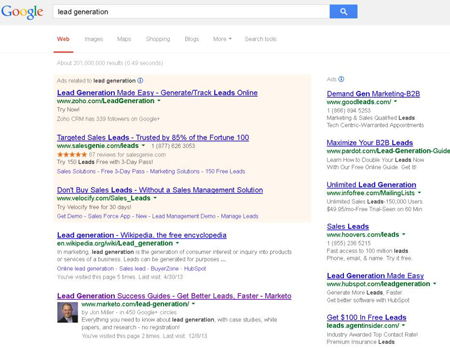 The following figure shows an example of the first page of Google results when searching for the term lead generation, so you get an idea of Google’s layout. Bing is Microsoft’s search engine. Bing is a fairly new search engine and gets approximately 18 percent of search traffic. It’s by no means catching up to Google’s 66.7 percent, but it’s still notable and worth spending some effort on. Bing also has its own algorithm for determining a page’s rank compared to similar pages found elsewhere on the web. Because Bing is a much younger search engine, it’s still trying to work out some of the kinks. Bing does not have some of the rich indexing capabilities that Google has today. According to Search Discovery, an interactive marketing agency, Bing hasn’t yet achieved the same sort of eye towards content, authenticity, and social signals as Google currently has. 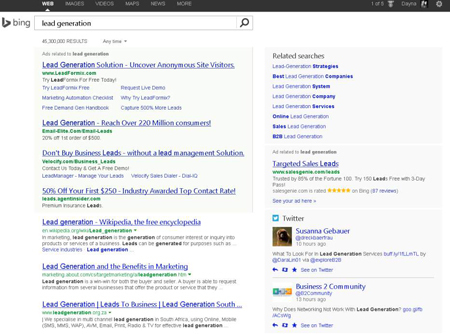 The figure below shows an example of Bing’s first page of results for lead generation. Notice the differences between the top page result here versus that in the previous figure. Also notice the addition of Related Searches and Social Results on the right side. In 2009, Bing and Yahoo! signed a ten-year partnership for Bing’s search engine technology to be leased to Yahoo! to provide search results from Yahoo!’s websites. Microsoft had incentive to do so to broaden its coverage against its main competitor, Google, but the jury is still out on the results. Yahoo!’s percentage of search share has dropped to 11.4 percent and continues to drop, presumably due to brand inconsistencies and an older search model. However, as with Bing, you don’t want to lose out on those 11.4 percent of leads who are die-hard Yahoo! fans. They search for things while using any of Yahoo!’s sites that provide loyal customers with free email, stock information, fantasy sports leagues, instant messaging, and even weather information. Like Bing, Yahoo!’s search engine simply isn’t as sophisticated as Google’s, and instead focuses on traditional SEO ranking factors that fail to recognize the importance of a multichannel world where social media and various devices reign supreme. In 2009, Yahoo! agreed to lease Bing’s search technology under the hood to power search results for their sites. One of the reasons, at the time, was to allow Yahoo! to focus on providing improved visitor experiences on its various website properties. Only time will tell how the effort and recent alliance with Microsoft will affect rankings. 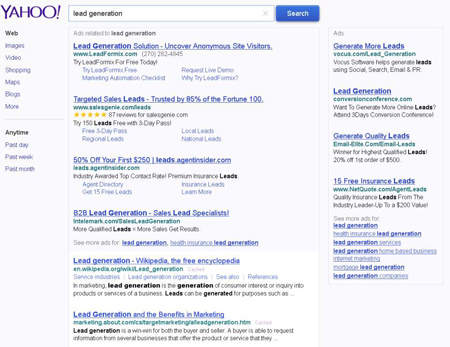 The following figure shows the results page of the same search term lead generation on Yahoo!. Again, notice the differences in layout and the results. Ads appear to the top left and to the right.